WITH OUR STATE OF THE ART TECHNOLOGY AND A HIGHLY SKILLED WORKFORCE, O’CONNELL CRASH REPAIRS CAN RE-INSTATE VEHICLES TO THEIR ORIGINAL MANUFACTURER’S SPECIFICATIONS, EVEN IF THE VEHICLE IS SEVERELY DAMAGED. A damaged car is not only inconvenient it is also upsetting so we try and help you in every way. We can recover your vehicle, repair it and source all auto parts needed. We deal with all the main dealers so there is no problem is sourcing any auto parts we need. We will even sort the paper work for your insurance company and all you do is pay the excess. We believe in the personal touch. 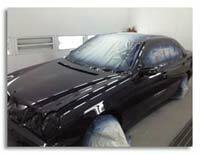 Custom paint jobs for Trucks, Cars and Bikes a specialty. Sign writing is another of our specialities. From small sign writing on motorbikes to large signwriting on the side of your truck. We can cater from the smallest to the biggest and the standard will still be top quality. Signwriting is one of the most cost effective advertising you can purchase. Signwriting is a great way of getting your name out there but remember it also reflects your business so we make sure it looks the best it can with a professional look that reflects your business. 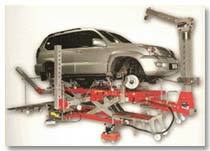 O’Connell Crash Repairs Ltd., specialise in chassis realignment of 4×4 and vehicles with Chassis damage. The Autorobot Electronic Chassis Alignment Measuring System allows for vehicles to be mounted on it and subjected to stringent measurement. The Autorobot creates a 3D image of the damaged vehicle which then can be matched to the original data from the manufacturer of that make and model if alignment is out the Autorobot can pull the Chassis with the aid of our fully qualified technicians can return the vehicle to its accurate original settings. We offer all Commercial Vehicle spray painting, repairs, panel beating and signwriting. We can achieve the highest of standards when it comes to colour matching with the Computerised Colour Matching System we have on our premises. We can spray paint all types of Commercial Vehicles here in our Metron Spray Booth which can hold two buses at one time. We deal with Scania, Volvo, Mercedes and many more. Spray Painting and panel beating or just part of the service we provide, we also do full body kits and signwriting. Our professional team of spray painters also offer a 3 year guarantee on any paint job done on our workshop floor. Our panel beaters will make sure all dents are removed, filled and repaired before the finishing touches of spray painting happens.